Mt. Thielsen acts like a guardian looking over Diamond Lake. As majestic as Thielsen looks it hasn't done much of a job looking over Diamond Lake. Through out the years the lake has had issues with invasive fish and algae. But this doesn't mean you can't enjoy camping and taking in the breathtaking views. 97% of water in Oregon has once flowed through a waterfall. Though Multnomah Falls gets most of the attention located along the North Umpqua River, Toketee Falls and Whitehorse Falls are just as breathtaking. Length isn't everything people! Fun fact: this lichen developed its neon color to avoid being hit in traffic. Bacon cooked over an open flame is what Elvis ate for breakfast every day! He also had it for lunch and dinner too. This concludes the fun fact portion of the post. 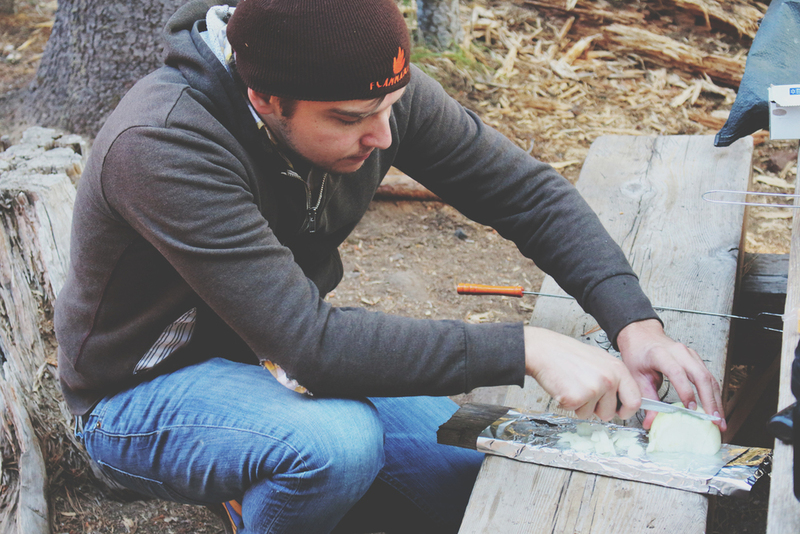 Kindling + foil = cutting board. It's simple math people! Things you'll need: a campfire (ideally with a grill on it), a cast iron skillet, knife, a metal spatula and hands with thick skin. Cook your bacon in the skillet. One of those metal marshmallow skewers works well for flipping the strips. Keep the grease in the pan! After dicing the onions place them in the hot bacon fat. No this isn't a low fat meal. No you can't use coconut oil or grapeseed oil! You're camping there's no room for lesser fats. Cook the onions stirring occasionally with a metal spatula until they are caramelized. Remove the onions from the oil and set aside, but leave the fat in the pan! This is what will flavor the eggs. Remove the skillet from the fire and stir the eggs into the pan. Put the skillet back on the fire. This technique will make the eggs far creamier. Constantly stir the eggs until done. Warm up your tortillas over the fire on the grill. PRO TIP: when cooking over an open flame bare hands are suitable utensils! Assemble your tacos! I recommend a layer of eggs, then onions, bacon and then topped with a little hot sauce and/or some cheddar cheese. Gary Jays will swarm your camp and they will eat anything they get their beaks on. They're cute, but don't trust em! They're shifty little birds. And now the sun sets on another Oregon Food Adventure post. *Death Cab for Cutie softly plays in the distance* Shhhhhh, I don't care that this is actually a sunrise. Shhhhh.